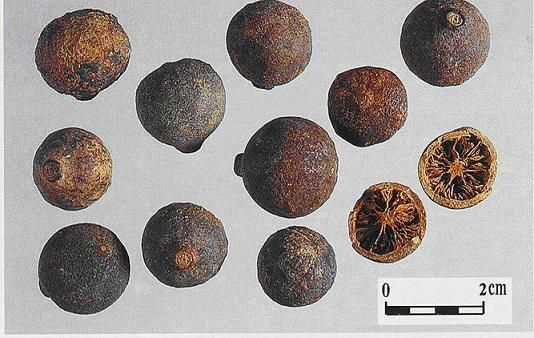 The immature fruit or the pericarp of evergreen small arbor Citrus reticulata Blanco of family Rutaceae. Guangdong, Fujian, Sichuan provinces in China. Colleted the immature fruits during the period of May to June when they fall from trees and dried in the sun, they are called Ge Qing Pi; collected the pericarp of the immature fruit during the period of July to August, cut it into four petals and dried in the sun, they are called Si Hua Qing Pi. Ge Qing Pi at best quality is dark green, even size, thick pericarp with strong fragrance; Si Hua Qing Pi is dark green scarfskin, white interior, heavy oily. Unprocessed or stir-baked with vinegar. Pungent, bitter, warm; liver, gallbladder, spleen and stomach meridians entered. Move qi and soothe liver, break qi and resolve stagnation. 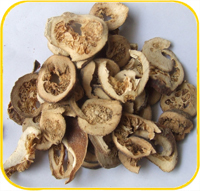 It has strong actions of promoting flow of qi and soothing liver, breaking qi and dissipating nodulation, so it is indicated for the treatment of syndrome of liver depression and qi stagnation. For liver qi stagnation due to emotional depression or failure of liver to convey and disperse due to violent rage manifested as distending pain in hypochondrium, it is usually combined with the qi-moving and liver-soothing herbs. For instance it is combined with Chai Hu, Yu Jin and Mu Xiang in Qing Yang Tang. For breast swelling, hardness and distending pain, it is usually combined with Gua Lou, Ju Ye and Si Gua Luo. For swelling and pain due to acute mastitis, it is usually combined with the herbs for clearing heat and relieving toxicity, moving qi and dissipating nodulation. For instance it is used in Gua Lou Niu Bang Tang in Yi Zong Jin Jian. For colic of cold type, it is usually combined with the herbs for warming middle energizer and dispersing cold, moving qi and alleviating pain. For instance it is combined with Wu Yao and Xiao Hui Xiang in Tian Tai Wu Yao San from Yi Xue Fa Ming. For menoxenia and dysmenorrhea due to liver depression and qi stagnation, it is usually combined with the herbs for soothing liver and moving qi, activating blood and regulating menstruation. For instance it is combined with Xiang Fu, Chai Hu and Dan Shen. It has the actions of moving qi and resolving stagnation, harmonizing stomach and alleviating pain. So it is indicated for abdominal pain due to qi stagnation or food retention. For abdominal pain due to qi stagnation, it is usually combined with the qi-moving and pain-alleviating herbs. For instance it is combined with Da Fu Pi in Qing Pi San from Zheng Yin Mai Zhi (Treatment on Symptom-pathogen-pulse). For abdominal cold pain due to congealing cold and qi stagnation, it is usually combined with the herbs for moving qi and alleviating pain, dispersing cold and warming interior. For instance it is combined with Chen Pi and Gui Pi (Rou Gui) in San Pi Tang from Yi Fang Lei Ju (Classification of Prescriptions). For abdominal pain due to food stagnation, it usually combined with the digestant herbs. For instance it is combined with Shan Zha, Shen Qu and Mai Ya in Qing Pi Wan from Shen Shi Zun Sheng Shu (Shen’s Treatment Book). For abdominal pain and difficult in defecation due to qi stagnation or food retention, it should be combined with the purgative herbs such as Da Huang and Bing Lang. It is good at breaking qi and dissipating nodulation, and also used for abdominal pain and mass due to qi stagnation and blood stasis. 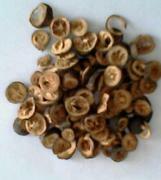 It is used in combination with the blood-activating and mass-eliminating herbs such as Dan Shen, San Leng and E Zhu. Decoct 3~10 g. The one stir-baked with vinegar is better at soothing liver and alleviating pain.